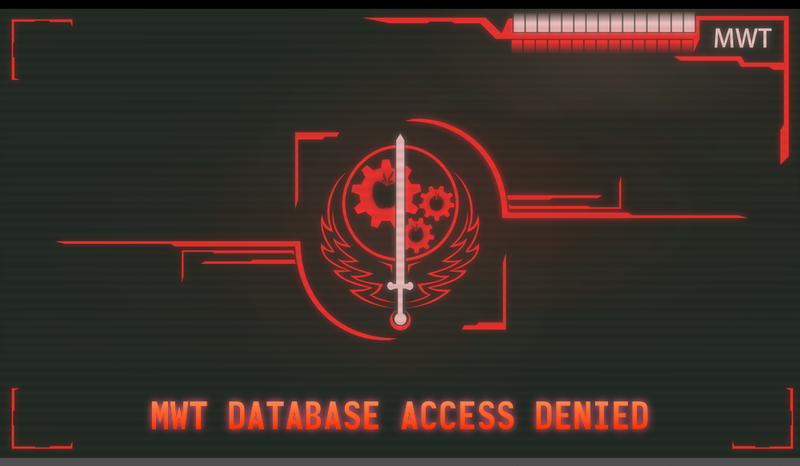 The following report was extracted from database terminals within an unidentified industrial complex north of New Pegasus. This requires further investigation, as Installation 043 only recently appeared in our location databases (See associated report). We strongly recommend sending out a contingent of NCR Rangers to secure the area as soon as possible. Note: The current logos and aesthetics are for prototype purposes only. They will not be used on production models. Please keep them confidential to within the Rock Farm Team. "Apple Bucker" Power Hoof - Unique variant of the standard MA-4B pneumatic power hoof. This unit is enchanted with an experimental strength talisman to increase the wearer's physical power. Several refinements were made to the pneumatic assembly, allowing the Bucker to hit harder and quieter at the same time. The Apple Bucker is slated for the Black Hunters SpecOps team for field testing when the prototypes are complete. "Diamond Dealer"/"Show Stopper" - These variants of the .44 Trail Carbine are designed to have a longer range than their standard-issue counterparts. The loading mechanism has been enchanted for quicker reload and a steadier fire rare. Minor enhancements to the firing chamber give each round better penetrating power, no matter the type of ammunition used. Command is still determining the best team to field test these weapons. "Kind Words"/"Soft Words" - The primary feature of this variant of the classic single shotgun is a longer range. Using experimental arcano-technology talismans embedded into the housing, it projects a magical field through the barrel to keep the scattershot in a tighter bundle for longer distance while also increasing ballistic velocity. Both models will be deployed to Ghost Team Bronco on the edge of Zebra territory. "Buccaneer Blaze" - Specialized sniper rifle based on the specifications of the DKS-501. Designed specifically for pegasus snipers, this unit possesses a minor cloudwalking enchantment to assist with positioning. It has a higher rate of fire and a unique combination of carbon fiber construction and weight talisman makes it substantially lighter than any sniper rifle of its class. This weapon was specifically requested by the Ministry of Awesome and will be delivered to the SPP Tower in Fillydelphia upon completion. The MoA will handle all field tests. "Spitfire's Thunder" - Classified MoA Project. Cloudsdale Level Clearance or above required for further information. "Absolutely Everything" - Variant of "Spitfire's Thunder." Classified MoA Project. Cloudsdale Level Clearance or above required for further information. Unit slated for testing in Appleloosa. "Crimson Streak" - Variant of "Spitfire's Thunder." Classified MoA Project. Cloudsdale Level Clearance or above required for further information. Unit slated for testing in Hoofington. "Party Thrower" - High-intensity flamethrower designed for jungle combat in hostile Zebra terrain. Refines normal "flamer fuel" into a treated material that burns hotter and faster upon deployment. Designated field testing with Vengeance Squad, currently on deployment at [REDACTED]. 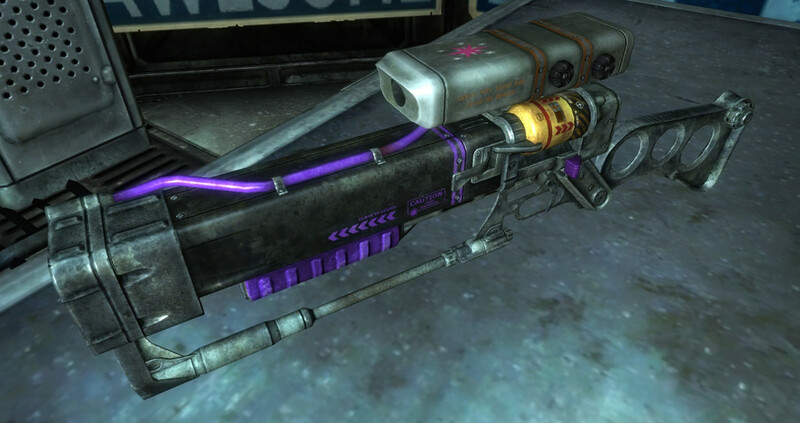 "Hyperglow" - Extremely powerful variant of the uncommon AER11x magical laser energy rifle. While originally plagued with energy consumption issues, the latest model now allows four shots before crystal reload instead of the original one. The changes in the energy crystals cause the beam to be a bright blue instead of the normal red associated with the AER11. This model is also scoped with a new MAS focusing talisman, making it an excellent energy-based sniping weapon for its size. "Overglow" - This variant is based off of the classic AER9x magical laser energy rifle. While Hyperglow is designed to be deployed in specific circumstances, Overglow is designed for almost any situation. Study with an extended series of crystalline capacitors, its new design hits slightly harder using the new jade gemstone focusing mechanism, also giving Overglow its distinctive green beam. At the moment, this unit is using the same chassis as Hyperglow though we intend to remove the scope to allow for quicker fire-response time. The Rock Farm has recently acquired schematics to two unique firearms and the ubiquitous "Zebra Assault Rifle." "Little Macintosh" - According to records, this weapon was the personal sidearm of none other than the Mare of the Ministry of Wartime Technology herself, though its current whereabouts are unknown. Our current schematics are incomplete, missing Applejack's original design for the cylinder, but we do have performance results. "Little Macintosh" may have been the most powerful handgun created by pony-kind. The addition of a powerful scope made this weapon utterly devastating at short-to-medium range and even effective at high range, depending on the skill of the shooter. 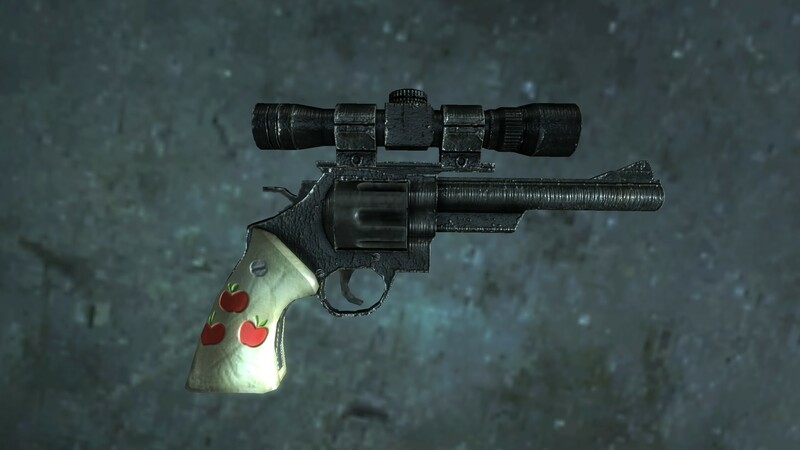 While at first glance, Little Macintosh appears little more than a standard .44 hunting revolver with a ivory custom grip (and the three apple cutie mark of Applejack), this weapon degrades at a substantially lower rate than similar weapons. In addition to being able to use all types of .44 ammunition, the weapon is utterly without magical enhancement, making it impervious to any magic-dampening fields that could cripple other high-end and/or experimental weapons. The Ministry of Wartime Technology is currently offering a 10,000 bit bounty on any information leading to the acquisition of "Little Macintosh." "Zebra Carbine" - Officially classified as the MX39-A Fury Assault Rifle, information on this weapon was acquired through special intelligence operations within the zebra government. Unlike the regular mass-produced Zebra Assault Rifle, intelligence suggests only about two hundred of these models were built and most of them remain within zebra lands, the weapons of choice for the Blood Guard protecting the Zebra Caesar. Only high-ranking members of the Zebra military are even authorized to know of the existence of this weapon. This deadly assault carbine is outfitted with a high-power scope and is far more durable than its run-of-the-mill counterpart. What makes this weapon such a threat is three-fold. First, this weapon is semi-automatic, firing in three round bursts. It can drive a full clip downrange within eight seconds. Most models appear to have an integrated silencer, making it an extremely effective medium-range sniper weapon. The last and most deadly component is the flame fetish built into the weapon's 5.56m feed system. As such, any ammunition used with MX39-A becomes enchanted with an extremely intense flame spell upon leaving the weapon. This effect is cumulative with any specialized 5.56m ammunition enhancement. Combined with the standard three-round burst, this makes the "Zebra Carbine" one of the deadliest anti-personnel weapons currently in the zebra's military arsenal. "Zebra Assault Rifle" - Every soldier knows this weapon as it is the zebra second-tier, general purpose automatic firearm. Hundreds have been recovered from battlefields during the length of the war and that in itself is a testament to the zebra's ability to mass manufacture reliable and easy-to-repair weaponry. The Zebra Assault Rifle uses the same ammunition as most standard automatic rifles and has no special enchantment or fetishes built into its housing. The only thing that makes the Zebra Assault Rifle unique is its relative scarcity on the west coast of Equestria. Despite this, the Rock Farm has several pallets of the weapons shipped from all over Equestria. Current tests are focused on shielding specifically against this weapon. Successfully stopping this unit will severely hamper zebra military operations in short to medium range engagements.